Hi, guys. I'm the new lady joining this boys' club. From time to time, I'll post on musical goodness happening in the Nutmeg State. Let's get this party started. You don't have to trek down to the city to catch the best of CMJ. 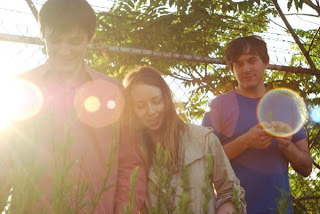 Just a few days after rocking the music marathon, Brooklyn three-piece Grooms will take the stage at Larry's. Their new album, Rejoicer, drops this month and they're itching to play live. Songs like "Dreamsucker" and "Acid King of Hell" start off easy but build with frenetic speed. With New Order-esque guitars breaking down into furious fuzz, their slightly off-key vocals always hit their mark. Thank goodness Death by Audio had the good sense to sign them. Catch them on November 5 for a taste of what's to come.